"D.K. Engineering", was established in the year 2005 as one of the leading manufacturers and Exporter of a diverse and commendable assortment of Gas Burners & Accessories. The range of products provided by us is inclusive of Stainless Steel Fabricated Bhatti, Bottom Burners, and Torch Burners, having a high preference in the market. Thus, the manufacturing is carried out in compliance with the industry defined norms and guidelines, employing the best quality of basic materials and components. Further, we offer these products at the best rate possible. We have established a modern and well-equipped infrastructure. We have a team of well qualified and experienced professionals which always focus on developing a quality approved product range. We have also constructed a highly advanced warehousing unit for well-mannered storage of bulk quantities of offered products. The facility is upgraded regular period of time, to maintain pace with our competitors in the market. In addition to this, our ethical working business approach and working as per the defined industrial norms has enabled us to attain a number of highly reputed organizations as our clients. Under the governance and guidance of our proprietor Mr. Ghanshyam Korat, we have achieved immense success in this domain. His ability to predict market changes, make precise and commendable decisions, make him our biggest asset to grow in this modern industry. Further, for the development of the firm, he provides special training sessions and counseling to the employees. Job Work, Manufacturing and Trading of Gas Burners and Accessories. 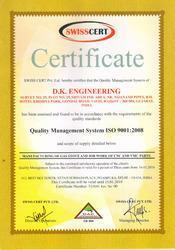 The pool of employees we have at D.K.Engineering is selected based on their past experiences and skills. Our team of dedicated and supported professionals is one of the key reasons behind our commendable success in the industry. For the purpose of better management of the team, It has been sorted into several units. The division is done based on their work. The units work dedicatedly to achieve the set industry goals. Our organization considered in the market to be amongst the popular manufacturers and Exporter of the quality approved a range of gas burners & accessories. For the purpose of following this market standing, we manufactured these products by utilizing the finest grade raw materials and advanced machines in our manufacturing unit. Owing to this, the offered products are broadly known for their efficient functional life and impeccable functionality at the client end. Our offered products are manufactured in tune with the set industry norms and guidelines.